Can you really put a dollar value on a species like Hector’s dolphins? Or should you? Surely the conservation and sustainability of our only native dolphin is enough to drive the correct decisions by our government. It turns out it’s a little more complex than that; the fishing industry has a powerful and well resourced voice that is very good at making itself heard. And they’ve come up with some very real arguments that are delaying further protection of Hector’s dolphins. So at Black Cat Cruises, we decided to step it up see if we could provide some more information to balance the economic argument of fishing with the economic benefit derived through tourism activities. We did this for the hub of Hector’s activity which is Akaroa/Banks Peninsula because it’s our home patch and an area we know best, but the results apply nationally. What’s been done in the past? There has been one attempt at putting a value on the species in 2014. 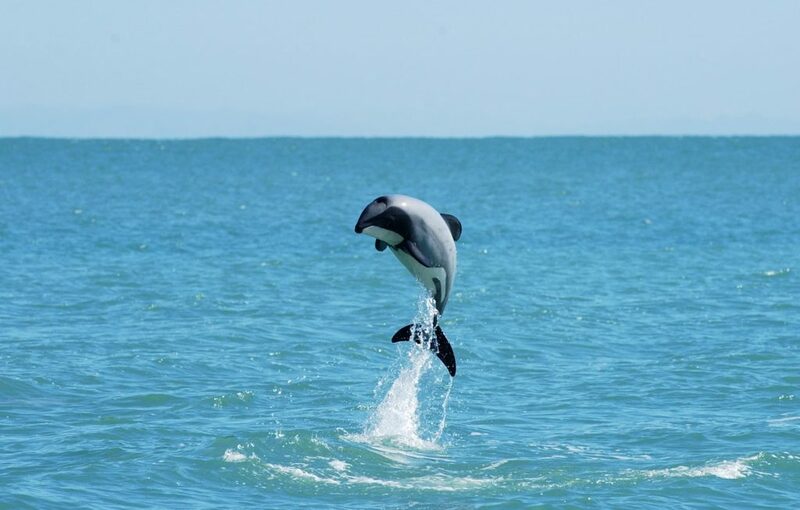 An international NGO (Whale and Dolphin Conservation) commissioned a study of the preferences of New Zealanders via a survey. This was based on what is known as a ‘non-value’ use. Forgetting economic impact what would Kiwis be prepared to pay to keep the species around. How much do we care in $ terms? This study determined values of between $355,000 and $440,000 per dolphin. This means that the estimated 130 dolphins killed every year in fishing nets represents an estimated $46 million NZD annual ‘welfare’ loss to the people of New Zealand. There have been other studies globally which try and put a value on a single animal. For example in 2011, R. C. Anderson assessed the extent and economic value of manta ray watching in the Maldives. The study showed a manta ray might generate around US$100,000 in tourism dollars through a lifetime while only worth US$500 if caught and sold. And elsewhere in NZ there have been numerous studies. Otago Peninsula has two rare marine species, the Royal Albatross and the Yellow-Eyed penguin, which attract tourists from around the world. Tisdell (2007) applied an Economic Impact Analysis (EIA) to establish the contribution of these two species to Dunedin’s regional economy. The study found that the annual turnover of the tourism operators directly offering eco-tours was estimated to be of the order of $6.5 M and 70 full-time persons were employed in the industry. 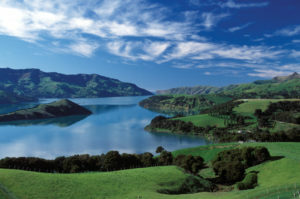 It was estimated that as a result of the eco-tourism associated with these species, approximately $100 million in GDP was generated in the Dunedin regional economy (directly or indirectly) and that 800-1000 full-time equivalent jobs were sustained. We appointed Market Economics to assess the economic impact of Hector’s dolphins at Banks Peninsula. 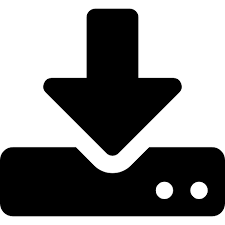 You can download the 28 page full report here. Importantly, we decided to measure the direct and indirect dollar impact from Hector’s dolphins tourism from international visitors only – rather than pushing it out further. This is quite a conservative approach, but accurate and dependable. 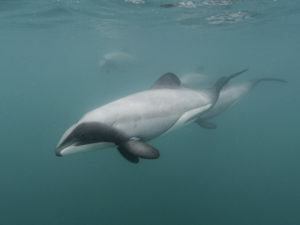 The report found Hector’s dolphin tourism is an important part of the Banks Peninsula economy and the wider Christchurch region. The relatively high incidence of Hector’s means that eco-tours offer an almost guaranteed sighting on every trip. 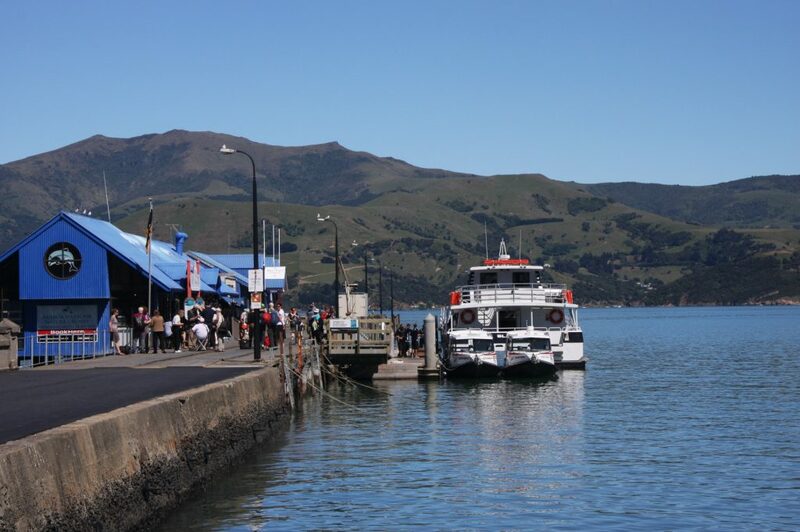 This high success is important in drawing many tourists to Akaroa, Christchurch, and to New Zealand. In today’s terms, Hector’s eco-tourism, and the wider economic impact is estimated to range between $22M and $25M in value added which sustains the equivalent of between 473 to 530 jobs in the Canterbury economy. The national value of Hector’s eco-tourism is estimated at between $28M and $31M in value added which sustains the equivalent of between 541 to 607 jobs in the national economy. In addition, looking at regional disbursement which is very important to NZ and to Christchurch. 64% of people rated dolphins as either very important or important in their decision to visit Christchurch in the first place. This means that the dolphins were a key decision influencer on whether to come to Canterbury at all for around 48,000 people in 2018. In addition 45% of people rated dolphins as either very important or important in their decision to visit NZ. 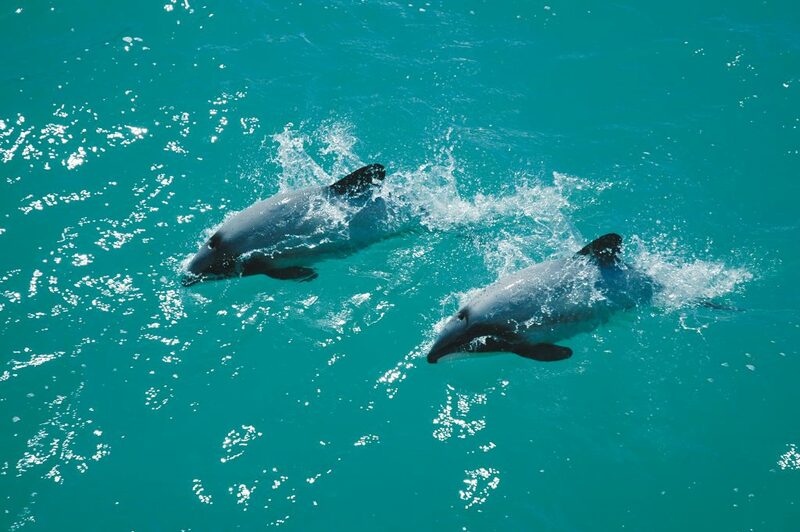 Clearly the viewing of native wildlife in their natural habitat is important to our international visitors and specifically seeing dolphins was a key influencer in whether to come to NZ at all for around half of our visitors. At an average spend of $3,300 per person who visits NZ, the dolphins influenced around $111M in national spend. ($3300 x 75,000 people x 45%). Taking this into account, and our marketing position of 100% Pure, it’s also fair to assume our potential visitors expect us to be actively protecting our native dolphins. How much damage is done to our brand with headlines like this? ‘Five Hector’s dolphins killed by commercial set net’ from an article in March 2018. Or this one ‘Three Hector’s dolphins killed in net off Canterbury coast’ from February 2019. Clearly the protection of a species like Hector’s dolphin is more important than dollars but it’s important to assess these numbers when looking at the economic impact on fisheries. The tourism industry has grown substantially in the 10 years since the Hector’s threat management plan was last assessed (and yes that also comes with its challenges). We’re calling on the Ministers of Fisheries and Conservation to take the tourism economic impact of Hector’s into account when assessing further protection for our dolphins. If the above numbers balance off against those from fishing, then the argument becomes solely about conservation – and that’s an easy one to win! The Hector’s and Māui dolphins Threat Management Plan is coming up for review and we have a small window of time to help. We are calling on our Prime Minister Jacinda Ardern to put much needed better protection in place for these endemic and endangered dolphins. We want to see protection for them out to 100 metres in depth to protect their habitat and the species from extinction. 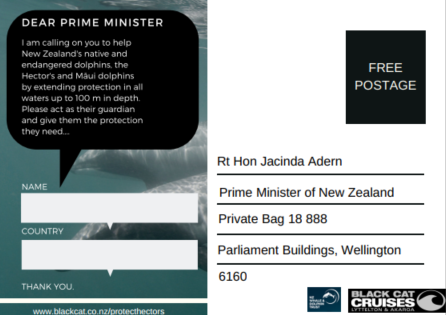 Click the link below and fill in your details and we will send a handwritten postcard on your behalf to the Prime Minister. [ Hoyt, E., McGrath, G., Bossley, M., Knowles, T., 2014 Assessing New Zealanders’ Willingness-to-pay to Protect the Endangered New Zealand Dolphin (Cephalorhynchus hectori): A benefit-cost analysis comparing three scenarios, Economists at Large, Melbourne, Australia and Critical Habitat Marine Protected Areas Programme, Whale and Dolphin Conservation, Chippenham, UK. This entry was posted in Akaroa New Zealand, Hector's Dolphins and tagged akaroa harbour, Hector's Dolphin, Protection.